What is the Ring Video Doorbell? You can think of the Ring Doorbell as a high-breed between the traditional doorbell and a sleek security camera. The Ring is a growing number internet-enabled devices known as 'the internet of things'. Basically this means that it is Wi-Fienabled and can be controlled on any internet enabled device - think smartphone, tablet or PC. There are 2 ways the Ring is activated - via the motion detector or if someone presses the bell. When activated, you will get a notification on your phone meaning you will never miss a visitor again. You can also install multiple extra bells around your home if needed. Probably the best feature of the Ring is the ability to actually talk back to visitors through your phone. This is super handy and means you can leave instructions for couriers or let friends and family know where you are and how long you will be. It is also a great security benefit, because if you are notified via the motion detector then you are able to shout at an intruder and tell them that you have informed the police. Ring provides three different models - The Ring Doorbell, The Ring Doorbell 2 and The Ring Doorbell Pro. Each of them have the standard core features mentioned above, but are slightly different in their quality and extra features. This product guide will take you through each one and point out the differences to help you make the right choice when buying one. Before we get into the differences, if you are still undecided on which brand of camera you need - you should read our great best security camera brand guide. It covers the top camera brands and a short review of their top 3 products. Now let's go through each one in turn and dive deeper into their features, benefits and pitfalls. When it comes to installation, Ring makes it super easy. You get a very nice installation pack that contains literally everything you need. As you would expect from a company that includes all of this, the actual installation is pretty straightforward. If you already have a doorbell that is powered by the mains, then you can simply replace it using the old wiring - that is assuming it is connected via a standard 8-24VAC supply! If you don't already have a doorbell then you can purchase a doorbell transformer and install that - this is a pretty good guide. The alternative is to simply run the Ring off the battery. Now the battery isn't like an iPhone which needs charging every day - you can run the Ring for around a month before it needs a charge. Charging the Ring is very simple via a microUSB port (the same charger as most Android Phones). You simply remove the Ring from it's base plate by undoing two screws and sliding it off - it is simply a 2 minute job. There is an obvious downside to having the Ring so easily accessible - it is easy to steal (assuming they covered their face obviously). Unlike more traditional security cameras which are placed in hard to reach locations, the Ring is usually placed at eye level. This makes it not only easy to steal, but easy for someone to break. To combat this, if your Ring is stolen and you submit a Police report then the company will replace it free of charge! Also, important to note is that early versions of the Ring contained information that would allow someone to hack into your Wi-Fi. However the company has since updated the firmware and this is no longer possible. There is no denying that the Ring Video Doorbell is very pleasing on the eye. The bottom half is covered in a nice sandblasted metal which comes in multiple metal choices, while the top half is a high-end glossy plastic. It is a little larger than a usual doorbell, which is to be expected considering the technology that it packs - 12.65 x 6.17 x 2.21 cm. The standard Ring camera has a resolution of 720p at 15fps. I know what you are thinking - wow that's quite low compared to most outdoor cameras. However the Ring has been designed for up-close surveillance and this resolution is perfectly adequate. If you want something a little higher then the Ring Video Doorbell Pro offers a resolution of 1080p at 30fps. What the Ring lacks in resolution, it certainly makes up in the field of view. The lens is ultra-wide angle resulting in a field 180 degrees horizontal and 140 degrees vertical. The drawback to such a large view is the footage looks quite rounded and 'fish-eye' however I think the trade-off is well worth it. Aside from the camera, the other only external feature which is visible is the actual doorbell button. The sleek plastic above the camera hides an array of inferred LED's that allow you to see who is calling in the dark. When someone presses the doorbell, the button flashes thanks to its surrounding blue lights. The Ring itself will then ring, and you can also purchase extra chines, which connect via Wi-Fi, to place around the home if needed. Also you can set it so that your phone will also get a notification. Setting up the Ring is really simple. On the camera itself you simply slide it off the mounting place and press the Orange setup button. You then download and install the Ring app and connect to the Ring via it in-built Wi-Fi signal - it's really easy adding it to your network. Then you will need to sign-up to the Ring service online and provide an email address and password (there is no fee for the Ring service) and you are up and running. Honestly, this is one of the easiest cameras to install. Not only is the Ring really easy to install, but its a doddle to use. The app is really clear and simple and makes the whole process of adding the camera to your network painless. The other important job of the app is connecting the device to the Ring cloud storage. This enables you to record any clips captured via the motion detector or ring and play them back later (you get 1 month free then there is a small fee for this cloud storage). Probably the most crucial function of the app is to provide notifications when the bell is pressed or when the motion detector is triggered. Through the app you can then view the camera and speak to the visitor - no matter where in the world you are. Let's be honest, this is probably the main reason you are thinking of buying a Ring in the first place. As mentioned above, the resolution is on the low side compared to most outdoor cameras. However it is plenty good enough for use as a doorbell camera. It does a pretty decent job of showing close-up detail combined with an excellent field of vision. The motion detection feature is what turns the Bell from a doorbell into a security camera. On this model you are not able to set up specific zones for the camera to ignore (think a road with passing traffic) - this feature is available on both the Ring Doorbell 2 and Pro. However, everyone I have spoken too say that the zoning is a little hit and miss and tend to leave the default mode where everything is recorded. The Ring has a great night-vision mode thanks to the in-built IR LED's just above the camera. As you can see above, even in a low light garden are the quality is still pretty impressive for 720p. Should I Buy The Ring Video Doorbell? The Ring is an amazing piece of kit. It provides you with a one-stop home security device - replacing the need for an outdoor camera and allowing you to monitor and interact with visitors. If you have a large house, it is also really easy to extend to range of the doorbell via the Wi-Fi chimes. Sure you can find cheaper IP cameras, however you will usually need separate software to make them work - and they are usually a pain to get working correctly. For the price the Ring comes with its own dedicated app, a cloud storage app and it's setup and ready to go in a matter of minutes - if this isn't worth the extra then I don't know what is. The only thing stopping me from giving the Ring an outstanding review is the fact that is it easy to steal / break. However the Ring promise to replace the camera if this happens is a nice touch. Improved battery charging, full HD video and interchangeable face-plates makes the Ring 2 a far better and more flexible model that the original. 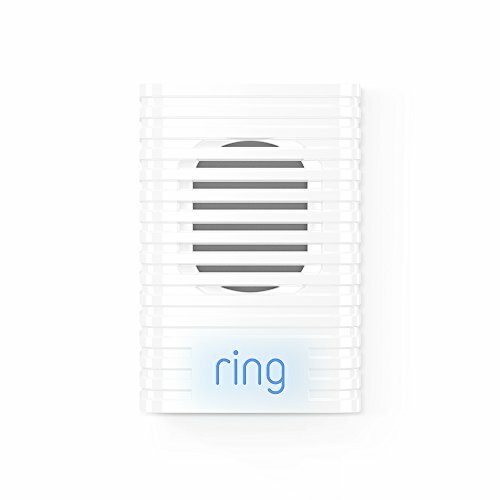 Just like the Original Ring Doorbell, Ring provide you with literally everything you could possibly need to install your new device (still no actual drill mind grrrr haha). The pack includes screws, raw plugs, spirit level, two-headed screwdriver and masonry drill bit. With the Ring 2 you get more mounting options. The doorbell comes with three mounting brackets. One which allows you to angle the doorbell down if you want to mount it higher than the recommended 4ft. One which is a corner bracket to allow you to mount the doorbell on a wall that's at 90 degrees to your door. And the final bracket is a modification for Original Ring owners. It allows you to replace your Ring with the new model without having to drill new holes. Also included in your pack is 2 different fascias - black and silver. This is a nice little touch so you can select the one which blends in most with your home. As with the original Ring, there are a few options when it comes to installation. The first option is to install a doorbell transformer and hardwire the unit to the mains. Even though this option will take the most time, once done you can forget about it. The second option is to run the doorbell on the battery. The original Ring batter lasted around a month before a recharge, however this new improved batter will last between 6 and 12 months - I don't know about you, but I personally think this is pretty amazing. You can purchase a spare battery if you want to simply swap them out. I've even found a cool solar panel which you can use to continuously charge your Ring - Check It Out Here. As you would expect, the Ring 2 still has the same issue of being easy to steal or damage. However Ring have extended their promise of a free replacement if you file a police report. Once you have finished installing the Ring Video Doorbell 2 then you need to connect to to the smartphone app - this will then get the device added to your home network. If you want to get technical, the Ring supports 2.4GHz 802.11n networks. Once you have got this far, you are pretty much setup. If you have hard-wired the Ring then a white light will surround the ring button. If you are using it on battery power then this won't be lite up to save power. However if someone presses the button, no matter if you are wired or using battery, the same blue lights will activate around the button. Well worth it! If you want to have better security without making it look obvious to people coming into your home or stepping on to your porch, this is the best way. I have not had my doorbell long but I have been impressed. My kids get a kick out of seeing their friends when they come over. Who doesn’t have wifi? How is that a con? LOL I was reading a lot of your reviews and debating on which is the best option for me and I like out this company sounds. It isn’t cheap but what it does for you is great. Specially if you have little kids or you travel a lot. Heck it is worth it to keep an eye on packages if you do a lot of online shopping! I was debating on getting these doorbells for my front and side doors. Thank you for the review. I moved into a new home out of state in an area I am still new to. My wife and I know next to know one around here so we wanted to be safe. I think I will go with these doorbells. I have the Ring Pro and while I do like it the video quality can be poor at times. It seems to depend on your wifi. If you do not have a strong or good wifi service you will want to upgrade before getting one of these. I am going to be bumping up my DL and UL speeds. Someone I work with had the same issues and upgrading her internet fixed everything. I had issues with the quality of the video which sucked and I was basically stuck with the doorbell. I don’t feel like it is enough not to look into it but for me, I need better quality. I live in an area that has been having a lot of issues with stolen packages. I will be getting a better option before summer is here. Not sure why there has been a fuss with the quality of the video here. I have not had a single issue. I am able to see people clear as day approaching my door. Even the night vision is spot on. I caught a cat digging out my potted flowers! Turns out it was the neighbors cat. He didn’t believe me but thanks to my cam doorbell I was able to show him. I have a question… If you buy a warranty for these doorbells, does it actually cover damages do to weather? I have a friend who had one of these installed and there was a bad storm in her area and a tree fell in her front yard and scraped the door and got the lens of his Ring Doorbell. Not sure if this is covered or not. Great question — Ring is a very customer oriented company. They should value your warranty — we can’t guarantee that or speak on their behalf but our experience in the field says yes! Good point Harold and we will reflect the review to state that! I have been very disappointed with the Ring Video Doorbell. Although setting the zones low, I get many alerts of cars going by. Yet it has not videoed or alerted when someone left a package. Customer service has been less than helpful. I think it’s a good concept that’s poorly executed. Definitely a waste of money in my case. I actually moved into a house that had these preinstalled and I did not know what the heck it was or how it worked. The realtor wasn’t familiar with them enough to tell me so I been researching it. These devices are FANTASTIC! I had no idea such a thing was around. My wife and I were playing with it with the kids. They love it too. We think it is great that we can see who is at the door anytime specially since we have heard of robberies that happen in the middle of the day from people just answering their doors. I got the basic edition/ model first and while I did like it, I ended upgrading to the pro a year later. I think for anyone debating on the two, it is well worth the extra $50. I also spoke to a few people on the differences and you can’t beat the upgraded versions perks. Very good article, honest too! Will share around. I am complaining about Ring, and the fact that apparently, it is not compatible with all original door bell models. This should be listed. I have had nothing but problems with the Ring Doorbell, it works periodically. The company will not take responsibility for the Ring Door Bell Problems, i.e., such as the door bell starts to ring and ring and will not stop until you remove the Ring Door Bell. Then you will be charged for having a technician come out to fix the issue; even after you have paid for a Tech to install the Ring in the Beginning. Presently, I have no door bell and will have to pay for an electrician come to my home to try and fix the problem, or remove the Ring and install my old doorbell. I mis-understood “Live Feed”. I thought that meant that i should actually keep it on where I could see out all the time. I thought either choice was where it would record if I had it on a setting for motion or the doorbell being rung. I am disappointed the live feed only lasts a short period and HOPE the option for continuous live feed is added soon. I like the idea of it once I saw it on Shark Tank a few weeks ago. It’s a way to keep up with technology in a part of your home that you use daily, the door! Another positive aspect of it is that if you are selling your home, you can open the door without even being present to those people viewing it. It can actually increase the value of your home! It’s a key focal selling point. For $200 it might be worth it, if it doesn’t have any bugs and doesn’t need to be replaced every few years. Good review. Really informative article. While I like the concept of this in the push for home automation, having used it about a few months I don’t see the merits of it for me personally. When I hear the doorbell ring, which is not very often unless I am expecting company then I rather walk and check the peephole. Very rarely, would I be excited to open the app and check who it is. Just my opinion. I have seen many things related to phone apps. Is there a desktop app, useable for an office? Great question. Since phone is so versatile and users carry; there isn’t at this time. For standard security camera systems yes; there is a desktop browser you can view the activity on.